A transient ischemic attack (TIA), also called a mini-stroke, is a temporary loss of normal neurological function, caused by a transient interruption of blood flow to part of the brain. The only difference between a TIA and a real stroke is that in a TIA, blood flow is restored before brain tissue actually dies. Anyone who has had a TIA has a high risk of having a completed stroke in the near future. So, if you think that you might have had a TIA, it is critical that you seek medical care quickly. The symptoms of a TIA are identical to the symptoms of stroke, except that the symptoms of a TIA go away within minutes to hours. A TIA is distinguishable from a stroke only when the symptoms resolve by themselves. Until that moment, for all practical purposes, you are having a stroke. If you or a loved one experience any of these symptoms, you need to get medical care immediately. Don't wait to see if things get better on their own! 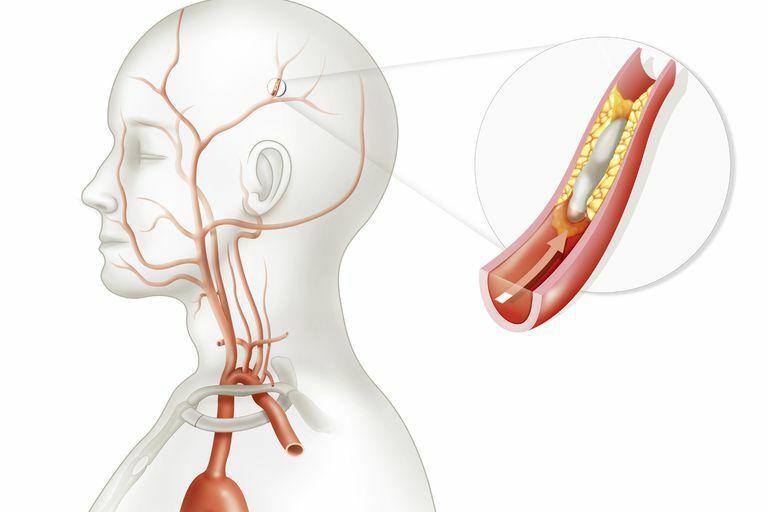 TIAs are caused by the same disease processes that produce stroke -- blockage of the arteries to the brain, mostly due to atherosclerosis or embolism. The only difference is that in stroke, the blockage persists long enough to produce the death of brain tissue. With a TIA the blockage is transient, and the brain tissue recovers once the blockage improves. TIAs are therefore analogous to unstable angina, a condition in which transient blockages in the coronary arteries produce chest pain. And just as unstable angina often heralds a full myocardial infarction, the occurrence of a TIA indicates that a full stroke is likely to occur. Because the risk of stroke is highest in the first few days to weeks after a TIA, a delay in seeking medical help can be catastrophic. The main goal of treating a person who has had a TIA is to prevent a stroke. Aggressively treating the risk factors that produce atherosclerosis, such as treating hypertension and cholesterol, getting excellent control of diabetes, and encouraging (demanding, if possible) smoking cessation. Antiplatelet therapy to inhibit the formation of abnormal clots within the arteries, with aspirin, aspirin plus dipyridamole, or Plavix (clopidogrel). Anticoagulation therapy with Coumadin (warfarin). If a significant blockage in a carotid artery is found, your doctor may recommend "carotid endarterectomy" (surgical repair of the blockage). Stenting of the carotid artery, while it is done, has not been shown definitively to be as safe or effective as surgical repair. A TIA is a very serious medical problem, even though the symptoms resolve on their own. By seeking immediate medical care after a TIA, you can greatly reduce your odds of having a full stroke. Easton, JD, Saver, JL, Albers, GW, et al. Definition and evaluation of transient ischemic attack. AHA/ASA Scientific Statement. Stroke 2009; 40:2276.